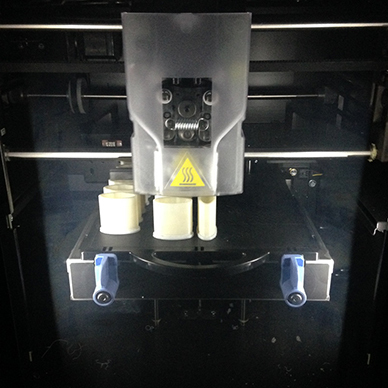 The Howard J. Moore Company has been offering quality Rapid Prototyping and 3D Printing solutions since 2014 when we purchased of our fist Stratasys Design Series FDM machine. These revolutionary machines allow us to rapidly produce parts with intricate geometries without expensive or time consuming setup and tooling. We only use industrial quality machinery, ensuring our FDM parts are structurally strong and dimensionally accurate (to within .007”). Our customers have used our 3D printed parts for everything from one-off end use parts, small batch production runs, proof of concept, pre-mold modeling, jigs and fixtures, and more. ABS+ is a durable and robust 3D printing material. This material is a true thermoplastic and when printed on a Stratasys Design Series 3D printer produces accurate and sturdy prototypes, models and parts. ABS+ and all of our other 3D printing options gives you the ability to manufacture parts direct from digital files that are ideal for conceptual modeling, functional prototyping, manufacturing tools and end-use-parts. ABS+ parts can generally be shipped 24-48 hours after receiving and order. PPSF/PPSU (polyphenylsulfone) material has the excellent heat and chemical resistance – ideal for aerospace, automotive and medical applications. PPSF parts manufactured on Fortus® 3D Production Systems are not only mechanically superior, but also dimensionally accurate, to better predict end-product performance. Users can also sterilize PPSF via steam autoclave, EtO sterilization, plasma sterilization, chemical sterilization and radiation*. PPSF and all of our other 3D printing options gives you the ability to manufacture parts direct from digital files that are ideal for conceptual modeling, functional prototyping, manufacturing tools and end-use-parts. ULTEM™ 9085 resin is a flame-retardant high-performance thermoplastic for digital manufacturing and rapid prototyping. It is ideal for the transportation industry due to its high strength-to-weight ratio and its FST (flame, smoke and toxicity) rating. This unique material’s preexisting certifications make it an excellent choice for the commercial transportation industry – especially aerospace, marine and ground vehicles. Combined with a Fortus® 3D Production System, ULTEM 9085 allows design and manufacturing engineers to produce fully functional parts that are ideal for advanced functional prototypes or end use without the cost or lead time of traditional tooling. EOS PA 2200 is a fine white powder form of Polymide 12 (Nylon 12). EOS PA2200 has a remarkably well balanced material property profile and is good choice for a wide variety of applications. In addition the laser sintering process makes incredibly durable and strong parts, and can be an effective replacement for injection molded parts. EOS PA2200 parts have high strength and stiffness, good chemical resistance, excellent long-term constant behavior, high detail resolution, and various finish possibilities.